The total breakdown of civil administration throughout the country required immediate measures to ensure the rebuilding of civil authority. After deposing Admiral Karl Dönitz, Hitler’s successor as head of state, and his government, the Allies issued a unilateral declaration on June 5, 1945, that proclaimed their supreme authority over German territory, short of annexation. 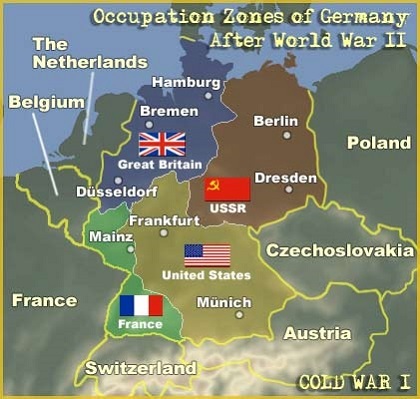 The Allies would govern Germany through four occupation zones, one for each of the Four Powers–the United States, Britain, France, and the Soviet Union. The establishment of zones of occupation had been decided at a series of conferences. At the conference in Casablanca, held in January 1943, British prime minister Winston Churchill’s proposal to invade the Balkans and East-Central Europe via Greece was rejected. This decision opened the road for Soviet occupation of eastern Germany. At the Tehran Conference in late 1943, the western border of postwar Poland and the division of Germany were among the topics discussed. As a result of the conference, a commission began to work out detailed plans for the occupation and administration of Germany after the war. At the Yalta Conference in February 1945, participants decided that in addition to United States, British, and Soviet occupation zones in Germany, the French were also to have an occupation zone, carved out of the United States and British zones. The boundaries of the four occupation zones established at Yalta generally followed the borders of the former German federal states (Länder ; sing., Land ). Only Prussia constituted an exception: it was dissolved altogether, and its territory was absorbed by the remaining German Länder in northern and northwestern Germany. 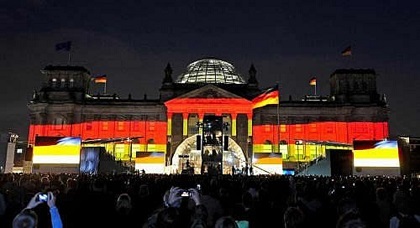 Prussia’s former capital, Berlin, differed from the rest of Germany in that it was occupied by all four Allies–and thus had so-called Four Power status. The occupation zone of the United States consisted of the Land of Hesse, the northern half of the present-day Land of Baden-Württemberg, Bavaria, and the southern part of Greater Berlin. The British zone consisted of the Länder of Schleswig-Holstein, Lower Saxony, North Rhine-Westphalia, and the western sector of Greater Berlin. The French were apportioned the Länder of Rhineland-Palatinate, the Saarland–which later received a special status–the southern half of Baden-Württemberg, and the northern sector of Greater Berlin. The Soviet Union controlled the Länder of Mecklenburg, Brandenburg, Saxony, Saxony-Anhalt, Thuringia, and the eastern sector of Greater Berlin, which constituted almost half the total area of the city.